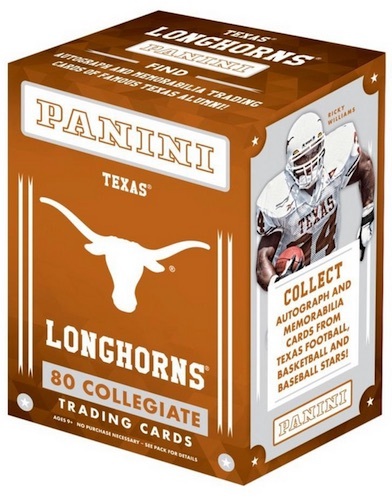 Head on down to Austin with 2015 Panini Texas Longhorns Collegiate. The multi-sport set takes a detailed look at the athletics program at UT and offers one autograph or memorabilia card per box. Highlighting some of the best former athletes to don the burnt orange, the 80-card base set includes notable stars from several sports. Derrick Thomas, Earl Campbell, Jamaal Charles, Ricky Williams, Earl Thomas, Malcom Brown and Jordan Hicks represent the gridiron while Kevin Durant and LaMarcus Aldridge check in from the hardcourt. Led by Roger Clemens and Brandon Belt, baseball is also featured. Signatures and Memorabilia cards are also available for some of the former players. Notable autograph subjects include Jamaal Charles and Earl Thomas. Adding another basic option, Honors is an inset set that focuses on award winners like the Heisman Trophy or Doak Walker Award. Building on the simple release, parallels extend to the base and insert sets with Silver, Gold and Black versions. In addition to Texas, there are quite a few other school covered by Panini in their line of Collegiate products. 2014 Leaf U.S. Army JERROD HEARD Autograph Refractor AUTO Texas Longhorns Rc! 80 cards. Player positions noted below.